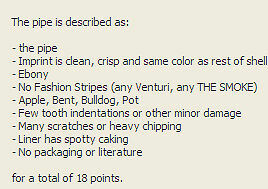 The value of pipe #585 is 18 points. William Carter (2money2maker2 on eBay) offered two the pipe in a lot. I had hoped that they would be the quite rare Coral (Melon) color, but they turned out to be the older shade of Federal Gold. So this one goes to the Pipes for Sale page because I have a better example of this exact color/shape in the collection and another very nice one on the Pipes for Trade page. The bowl liner looks sound, but needs a good cleaning. The mouthpiece has a couple of dents, but it draws OK. The finish has a lot of small dings and scratches with some paint wear on the corners of the shank. Joe Stallings found this site and decided to try this one out and, while he was at it, bought three more!